Courtesy of the Timber Heritage Association Bear Harbor Lumber Company #1 under steam at Fort Humboldt. 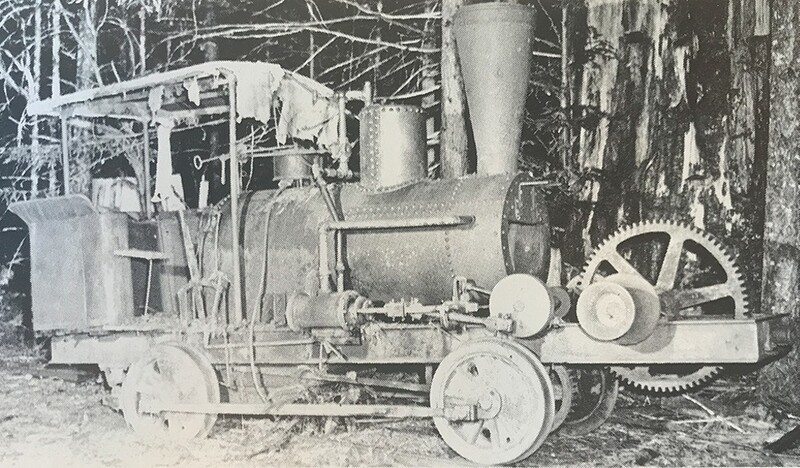 From the Douglas S. Richter Collection Bear Harbor Lumber Company #1 as she was "found" in the woods, about 1940. 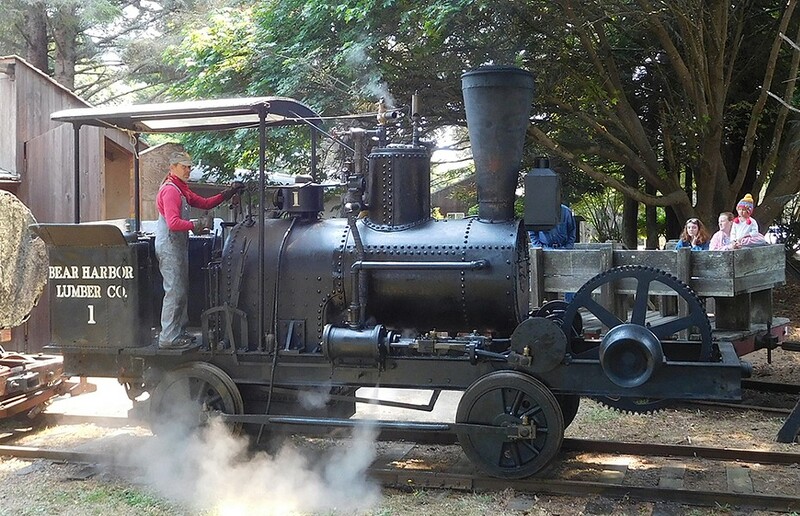 From May to September on the third Saturday of each month, visitors to Fort Humboldt State Park enjoy free rides behind a couple of veteran steam logging locomotives, courtesy of the Timber Heritage Association. 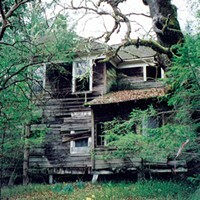 The Falk operated for 40 years from 1884 on, including serving Noah Falk's eponymous town. The other announces her heritage in large letters on the side: Bear Harbor Lumber Company No. 1, and she has quite a history. Hikers into the Sinkyone Wilderness south of Shelter Cove pass Bear Harbor, a rocky indentation on Mendocino County's north coast. That is where — somewhat incredibly, given the rugged topography — a steamer from San Francisco delivered her in 1892. She became the first of two locomotives to run on the short-lived Bear Harbor Railroad. She was one of just 20 "Gypsy" 0-4-0 steam locomotives built in San Francisco between 1882 and 1892. Designed specifically for California timber operations before John Dolbeer's steam donkey engines became commonplace, they combined the qualities of both log-haulers and donkeys. In the latter role, a Gypsy sat on the tracks while hauling and loading logs with the front-end capstan winch. Five partners, all lumbermen, incorporated the Bear Harbor Lumber Company in 1893, aiming to log about 12,000 acres of virgin timber — mostly old growth redwood — in the forests surrounding Bear Harbor, although at first the main products from the area were tanoak bark (for tanning leather) and railroad ties. The Gypsy originally ran on 2 miles of standard-gauge track north from the wharf but this line was soon extended with the construction of a 1,900-foot-long incline with a rise of 600 feet up from the coastal flat. The incline used a three-rail gravity system: loaded cars coming down hauled empty cars up, passing each other midway where the rails separated. In 1895 the track was extended from the top of the incline (at present day Usal Road) to a logging camp with an engine shop and warehouse. The camp was named after Lew Moody, who built a hotel and saloon there. You can find the now-overgrown site on USGS maps on the northwest bank of Indian Creek. The Gypsy serviced the 8 miles of line from the top of the incline to Moody, while horses were used on the level 2-mile coastal stretch. Gypsies, like most logging locomotives of the time, were built to standard gauge (4 feet 8 ½ inches). This suited the grandiose ideas of Henry Neff Anderson, chief partner in the group that acquired the stock of the Bear Harbor Lumber Company in 1903. At the time — the early 1900s — the Atchison, Topeka and Santa Fe Railroad was vying with the Southern Pacific to build a railway from San Francisco Bay to Eureka, planning a route down the South Fork of the Eel. The flat where Indian Creek empties into South Fork was, in Anderson's eyes, the ideal location for a stop on the railroad, from where timber from the coastal forests could be shipped south to San Francisco Bay. We'll follow the rest of the story of the Bear Harbor Railroad next week. Thanks to Jerry Rohde and Mike Kellogg for help with this story. Barry Evans (barryevans9@yahoo.com) strives to remain objective when writing about logging history, knowing only 5 percent of original old-growth redwood remains.